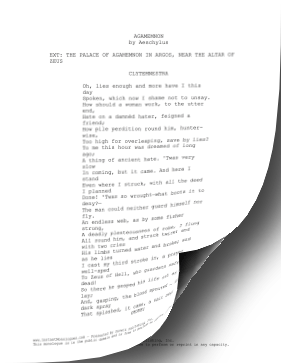 Spoken by Clytemnestra in rhyming couplets, this 2-3 minute speech from Aeschylus' Agamemnon is intended for actresses of middle age. Spoken, which now I shame not to unsay. Too high for overleaping, save by lies? The man could neither guard himself nor fly. To Zeus of Hell, who guardeth safe his dead! O'er a parched field, the day the buds are born! Curse-fraught, and here hath drunk it to the lees!